The food is amazing, the service is fantastic, and the view of the ocean is incomparable. If your looking for a Laguna Beach restaurant that will provide an extraordinary experience, Splashes is one of the best fine dining choices in town! This Laguna Beach restaurant serves breakfast, brunch, lunch, and dinner- as well as cocktails! Splashes Restaurant serves American Coastal Cuisine crafted by award-winning chef Jeff Armstrong! After trying amazing dinner selections ranging from Chilean Sea Bass, Semolina Dumplings, or Grilled New York Prime you'll begin to understand why so many people return to Splashes time-and-time again. However, Splashes offers more than simply dinners, come during day to enjoy breakfast, brunch, lunch, and even cocktails! Spashes Restaurant serves patrons throughout the day! So whether you're staying at the Surf and Sand Resort, planning a special date, or just stopping by to enjoy cocktails... Splashes will be ready for you! Splashes Restaurant is perched directly above the sand on the beach, so for you romantics out there... make sure to save time for a walk along the sand after you finish your dining experience. 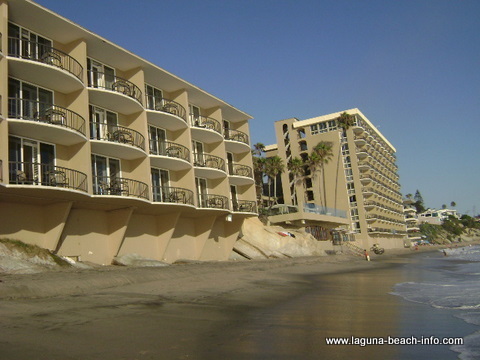 Splashes Restaurant is located directly over the beach at the Surf and Sand Resort.